Nice work if you can get it? 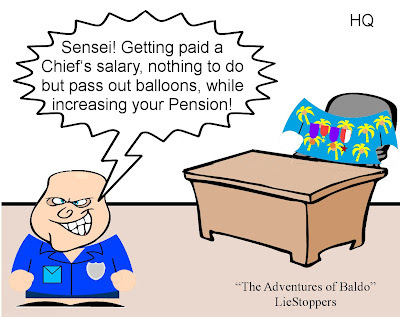 I have never heard of a Police Chief staying in the PD for the purpose of getting his pension increased after he has announce he would be retiring and a new Chief has been appointed. Honestly why does the City Manager put up with this? Simple, the City Manager is just as big a hack as the Police Chief. Baker is taking notes as to what Chalmers is doing so he can do the same thing when it comes time for his own pension enrichment scheme. People in the public sector in Durham have shown themselves to be averse to note-taking, but where it can lead to additional money in his wallet, Baker will make an exception. Durham is run by politicians for the benefit of politicians. Baldo: I KNEW you were the shining Knight, Sir Marco! The talent gave you away. Chief Chalmers really should forfeit his pay since the day he was appointed chief, after the botched chief search. He has been an empty suit and a do-nothing chief ever since then. Not to mention the hug-a-thug mentality that he exudes, and which permeates the entire department, and prevents the good officers from taking the fight to the real criminals.